It is hard to image how curious the babies are, they just can't help exploring the world around them, they are too young to figure out whether is danger or not. As the parents, we have to take extra precautions to keep the danger out of their reach. By the way, not only the kids, but our pets have an abundance of curiosity, the cats and the dogs like to sneak into the closets to play and explore. Sometimes we have to look for an easy solution to keep the easy-opening furniture closed, preventing some unnecessary messy. *2 keys can unlock all locks, 2 key-base for easily store keys. 2 Magnetic Keys can open all magnetic locks. You can stick the key holder on the wall or on the refrigerator, easy for you to get it but keep it out of the kids' touch. 1. Keep the surface clean and dry before installing. 2. The adjustable strap can be adjusted to 3 to 7 inches. 3. Heat them with blow dryer for one minute when you want to remove it. 4. Follow the direction to ensure the alignment before installing the lock to cabinet door. 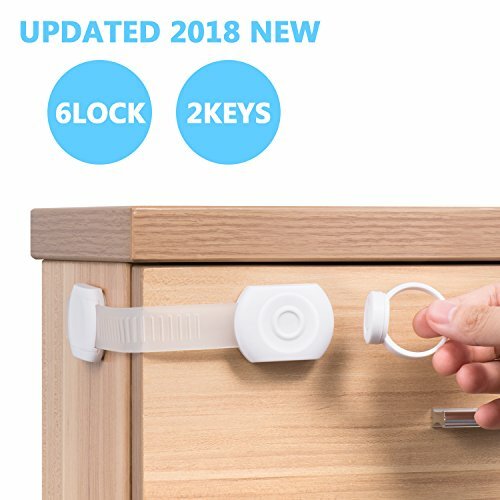 ①Updated Safety Locks---Updated safety locks uses magnetic force to unlock, easily for the adults to open the locks with magnetic key, but difficult for the baby to figure out, much safer than normal ones. ②Wide Usage--- Lock the furniture that your baby likes to get access, like the door, closet, cabinets, cupboards, drawers, ovens, toilets, fridge, window and other easy-opening furniture. ③No Tools Installation--- Strong 3M adhesive allows you to install the safety locks in short time, no drilling, no nails, and no screw, no damaging the surface when you are ready to take it off. ④Flexible Material--- Flexible and adjustable length strap works on both flat surfaces and around corners. TPE material makes it withstand the baby's pressing or pulling without breakage. ⑤One Year Warranty---Customers' satisfaction is our priority. Our products are backed up with 1 year warranty for replacement and refund, for any problems, just email to us. If you have any questions about this product by Carebaby, contact us by completing and submitting the form below. If you are looking for a specif part number, please include it with your message.